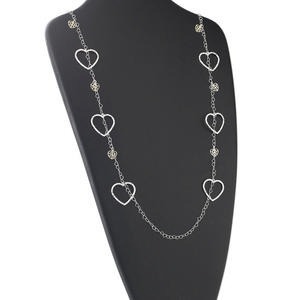 Necklace, sterling silver and cubic zirconia, clear, 22x17mm double heart, 16 inches with springring clasp. Sold individually. 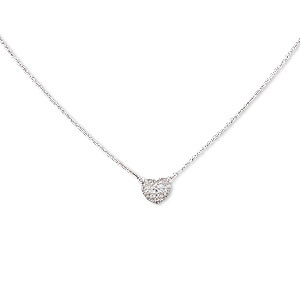 Necklace, cubic zirconia and sterling silver, clear, 27x12mm sun, 16 inches with 1-1/2 inch extender chain and lobster claw clasp. Sold individually. 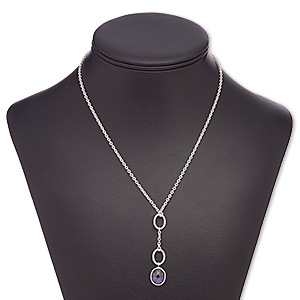 Necklace, sterling silver and cubic zirconia, purple, 2-inch dangle with 13x12mm oval, 17 inches with lobster claw clasp. Sold individually. 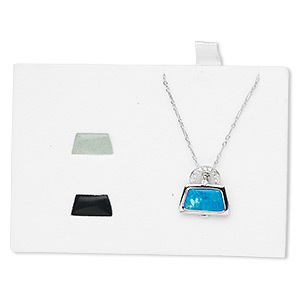 Necklace / bracelet / earring, sterling silver and cubic zirconia, pink / green / blue, 18-inch necklace with 2-inch extender chain and lobster claw clasp, 7-1/2 inch bracelet with lobster claw clasp, 2-inch earrings with post. Sold per set. 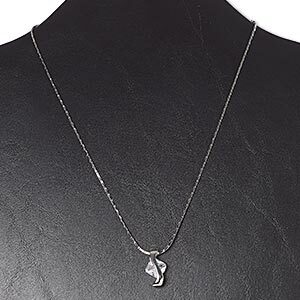 Necklace, cubic zirconia / imitation rhodium-finished brass / copper / steel, clear, 21.5x12mm freeform, 15 inches with 3-inch extender chain and lobster claw clasp. Sold individually. Necklace, sterling silver and "vermeil," soldered link chain with 10x9mm and 27x25mm textured heart dangles, 42 inches with lobster claw clasp. Sold individually. 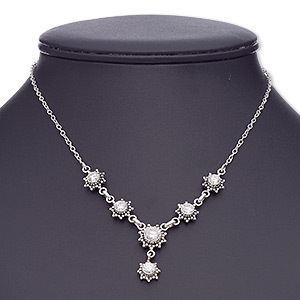 Necklace, multi-gemstone (natural / dyed) / cubic zirconia / rhodium-finished sterling silver, clear, purse, 16 inches with 2-inch extender chain and springring clasp. Sold individually. 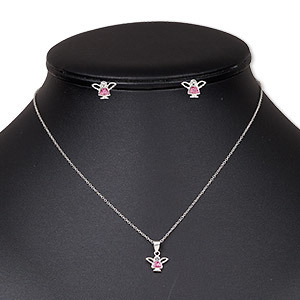 Necklace and earring set, sterling silver / glass rhinestone / enamel, pink and clear, 10.5x8mm angel, 15" to 16" necklace with springring clasp, earring with post. Sold per set. 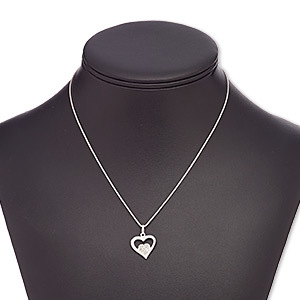 Necklace, glass with rhodium-plated brass, clear, 8x8mm pavé heart, 16 inches with lobster claw clasp. Sold individually. 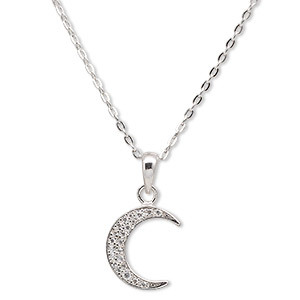 Necklace, Simple and Sleek Jewelry, cubic zirconia and rhodium-plated sterling silver, clear, 12x10mm moon, wearable at 16 and 18 inches with springring clasp. Sold individually. 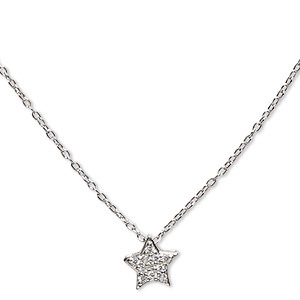 Necklace, Simple and Sleek Jewelry, cubic zirconia and rhodium-plated sterling silver, clear, 8mm star, wearable at 16 and 18 inches with springring clasp. Sold individually.